UPDATE: The NEW Mockingjay Part 1 Teaser Trailer is here! Click HERE to watch. 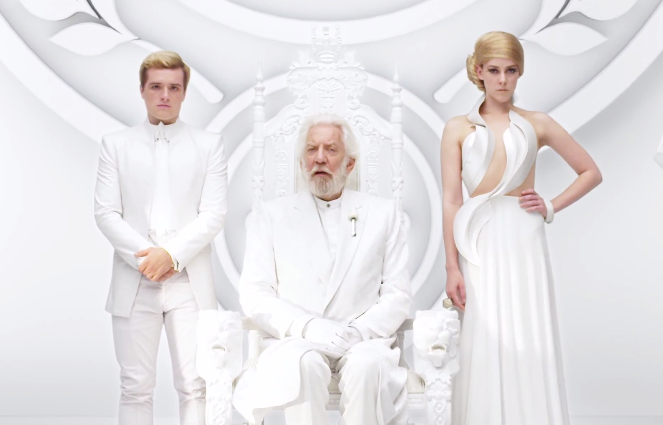 The Brand NEW Second Teaser Trailer for The Hunger Games: Mockingjay Part 1 has now been released, featuring President Snow, Peeta Mellark, Johanna Mason....and a surprise from District 13! You can watch the full video below. The Mockingjay lives... You can also watch the FIRST Teaser Trailer for Mockingjay Part 1 HERE or ALL the released official Trailers, Teasers and Behind-the-Scenes Clips for The Hunger Games, Catching Fire and Mockingjay Part 1 in our TRAILERS PAGE. FEATURED POST: This is a featured post. All new posts are below! What are your thoughts Tributes? Let us know what you think of The Hunger Games: Mockingjay Part 1 Teaser Trailer #2 by sounding off in the comments. Follow us on Twitter @TheHungerGamers and Like us on Facebook at Facebook.com/TheHungerGamers for the latest news and updates on The Hunger Games: Mockingjay Part 1 and Part 2.